Hopefully you all have voted. by now. Polls are closing soon and it’s raining here in Chicagoland. I don’t have a live TV feeds so I’m doing a bit of a junkie shuffle wanting to know how the voting is going. Here’s some disturbing election day news. First off, at the moment Romney has 66% of the popular vote. Secondly, Someone shot a video of themselves voting when they realized that the machine was changing their vote. You have probably heard that Star Wars/LucasArts has been purchased by Disney for over 4 billion Dollars. There have been a number of articles circling the interwebs coming down on this as either a genius or woeful move. For all of you voting in California take a look at Stoya and James Deen’s feature in the New York Times regarding a certain Anti-sexwork proposition. Romney, surprise surprise, treats women like binders. Take a look at the latest collaboration between Molly Crabapple and Kim Boekbinder as they talk about intro/extraversion. CNN hosts a digital art gallery called Power. 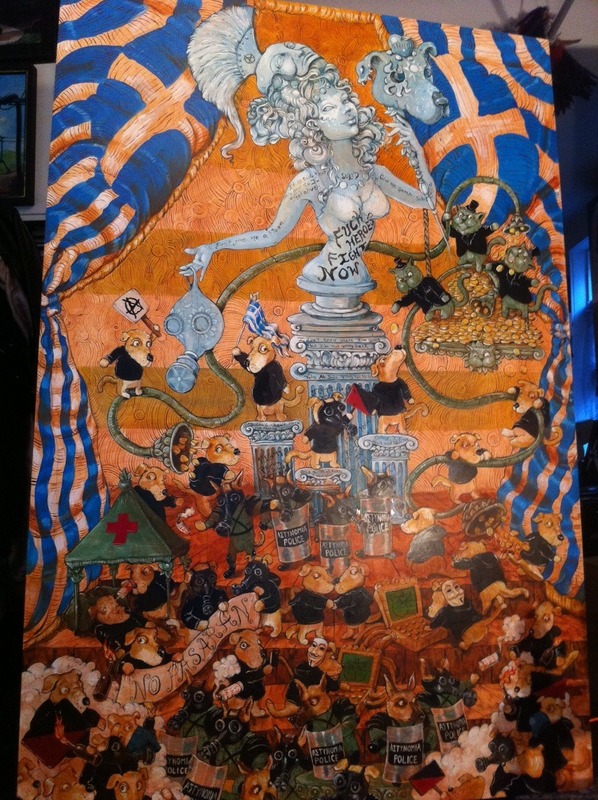 Featuring some leading political art in the world, including the dear Molly Crabapple. Japanese Illustrator/artist Yosuke Goda creates a room that looks like it eats you. Iran bans women from university in order to make them Ninja Assassins… sort of. Palestine is making economic surges and questioning what direction is best for their people. Tom Stoppard may start his very own Marvel super team up with HBO, Benedict Cumberbatch, Ford Maxon Ford. We left the windows open today. Not that they do much good closed, but the air has chilled and we just lay on the living room floor enjoying the breeze running through the house. Her hair tickles my neck and causes me to shift and stir. The sun is low now. It bounces through the glass and when I turn toward her she is trying to shade her eyes. On the other hand she may not believe you. Again she may think you’re just trying to get in her pants. Whether or not she thinks this she may then think you are lying to her, either talking down to her or directly insulting her intelligence. And perhaps if she is intelligent and not very confident in her appearance there is the chance that she might actually think you are a moron for admiring her looks. Nonetheless, I find myself on the floor here wanting to say just that, as simply as possibly. I can’t. Because of course as a writer and a college student, living in a house full of college students there is the added stigma of simplicity. The thought being that anyone who uses such a simply structured three word sentence – “you are pretty” – when they could have used ten or at least something more complex, or, even better, something that someone else said (though I fail to see how this is a positive alternative to something original), – i.e. ‘Shall I compare thee to a summer’s day blah blah blullshit – just isn’t trying hard enough and is therefore stupid. This is not to say all women are like this. It is also not to say that men aren’t like this either, if not more so. Which would make sense as, for some reason, our culture has decided it is not as normal for men to compliment each other on appearance as women, and men would therefore be less comfortable with taking said compliments. This just happens to be my unfortunate history with making such comments to the particular women I have known. Such a common question, but she’s almost always asking that when I’m right in front of her, never by phone. I realize now that I’ve been staring at her for some time without looking at her. I shake my head to loosen all those nuts and bolts up there. So I don’t tell her she’s pretty. Instead I make some offhand pseudo poetic sounding line about the low angled rays of sunlight on her skin. She laughs and pulls in close kissing and nibbling at my neck. I growl at her. I push back against her with my head like when a cat is trying to get your attention. “Grrr…I’ll show you little.” I slide my hand up her leg, under her skirt. I love when we play out these conversations; the ones we know in at least three moves in advance. Not that we are playing against each other or anything. Just playing it out with our heads butting like this. The cuteness of in all should make me gag, but right now I’m past caring. The day is too nice, too cool, too calm for caring about trifles. The only other people around are my housemate and his girlfriend who are in the kitchen. I pull her tighter, squeeze her thigh and listen to the fall wind singing through the windows and the sound of frying sweet potatoes.